Not that I’m complaining, but the weather seems weird to me. Does it to you? When the 24th of May ranged from 59-70° and the 25th of January was 73-81°, well…that’s just plain weird. They must be screwing around with our weather. Again. Whoever they are. Probably the same they as in “They tried to tell us we’re too young, too young to really be in love…” You know. Them. Rampant paranoia aside, I prefer cool summers. Bring on the fog! Let it linger until November. Those nattering nabobs of nitwitism who reside in the howling wildernesses east of the Colorado River claim we have no seasons here. Sorry folks; we do have seasons. Roughly equivalent to Spring, Summer, Fall, and Winter are: Fog, Smog, Fire, and Mudslide. Recently, Mudslide season dwindles while Fire expands. ¡Qué lástima! It always seems odd when lots of birders appear at the lagoon in May and June as, bird-wise, those are the two slowest months. “Don’t be disappointed,” I say, “but it’ll be sparse. Come back September through March, and there’ll be many, many more.” But now, the wintering birds have left, most migrants have passed through, many of our local nesters are concealed, sitting cryptic and quietly on well-hidden nests, or skulking about, trying not to be captured and consumed. ground. We didn’t know if this was a foraging behavior, an anxiety/startle behavior, or a display of sexual attractive or aggression. A little research showed that this is a long-debated topic. One paper (Hailman, Wilson Bulletin, Dec 1960) concluded it was primarily a foraging technique, intended to startle insects into movement. Others aren’t so sure, ‘unease’ or alarm being a possibility, as is aggression. 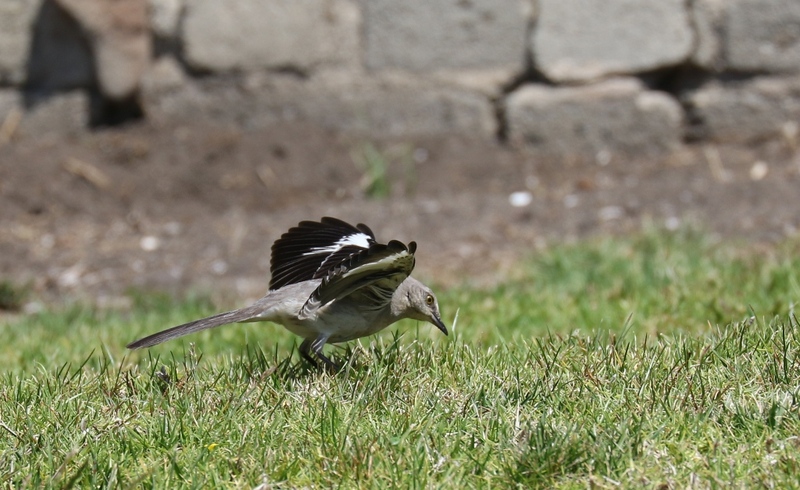 All 14 species (4 or 5, depending on who’s talking, in the Galapagos alone) of mockingbirds do this, whether or not they have white wing-panels as do our Northern Mockingbirds. They also flap and leap while singing. Apropos of nothing whatsoever, here’s a nice hour-long video/soundtrack of birdsong and babbling creek, good for listening to while researching mockingbird behavior. These birds are all off nesting – or should be, if they know what’s good for them. 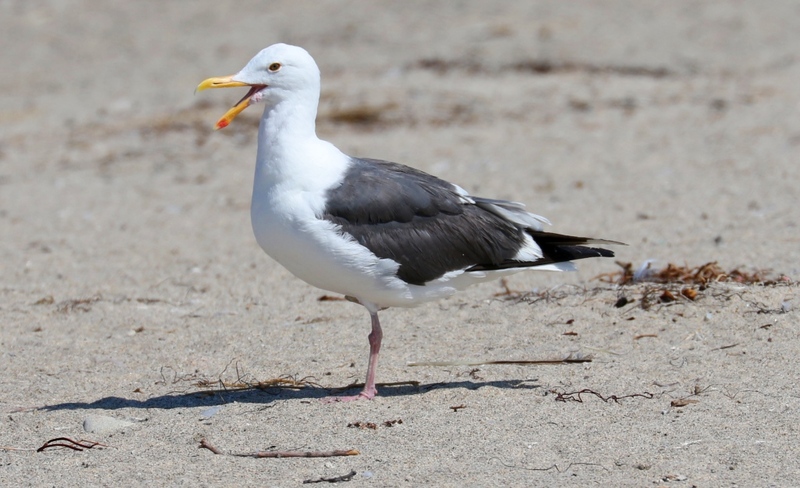 The Heermann’s, for example, begin laying eggs in late April at their eight known nesting areas; 95% of the species’ 150,000 pairs nest on Isla Rasa, located about halfway down the Sea of Cortez. At the same time, this tiny island also hosts over 90% of the world’s 40,000 pairs of Elegant Terns. It’s a busy, noisy, stinky place this time of year. But changes in weather, sea currents and sea temperatures cause massive changes in availability of food fish. The Elegant Terns may have suffered a complete nesting failure this year on Isla Rasa due to lack of food. Many of the Gadwalls looked like young birds – not ducklings, full size but not in adult plumage. 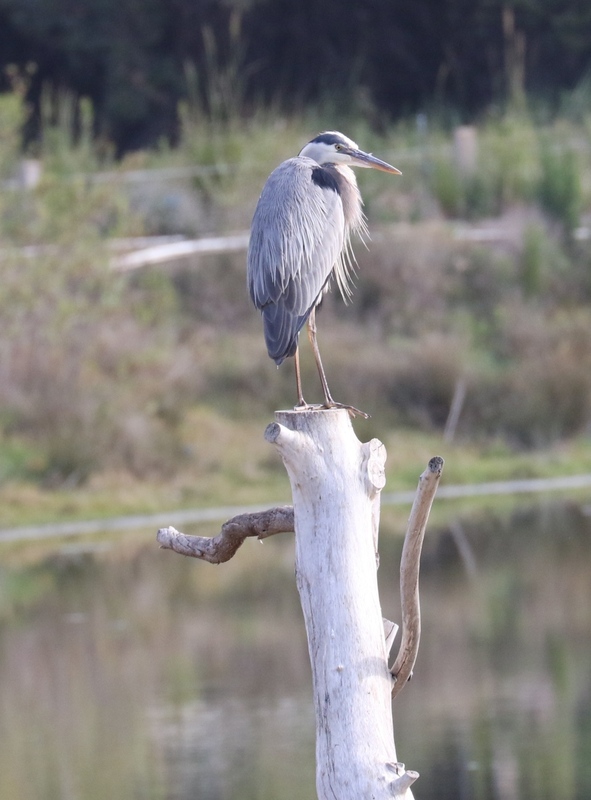 Perhaps they are the result of early nesting near the lagoon? We didn’t see any warblers – not a single Yellowthroat – but the Song Sparrows sang up a storm, various swallow species made off with mouthfuls of mud to build nests on nearby walls, and hummingbirds, particularly the Allen’s, were almost abundant on Adamson House’s flowered wall. A couple of cormorants staggered around the lagoon-edge with sticks in their mouth, and across the street, the top of the recently shaved nesting tree next to Starbuck’s was adorned with egrets and their nests. is yellow in the female and orange in the male – always nest in palm trees. Look on the underside of palm fronds for their light brown pendulous nests, suspended near the central frond shaft, woven of thin fibers from palm leaf and trunk. Adult males have a large black ‘bib’ on their throat. 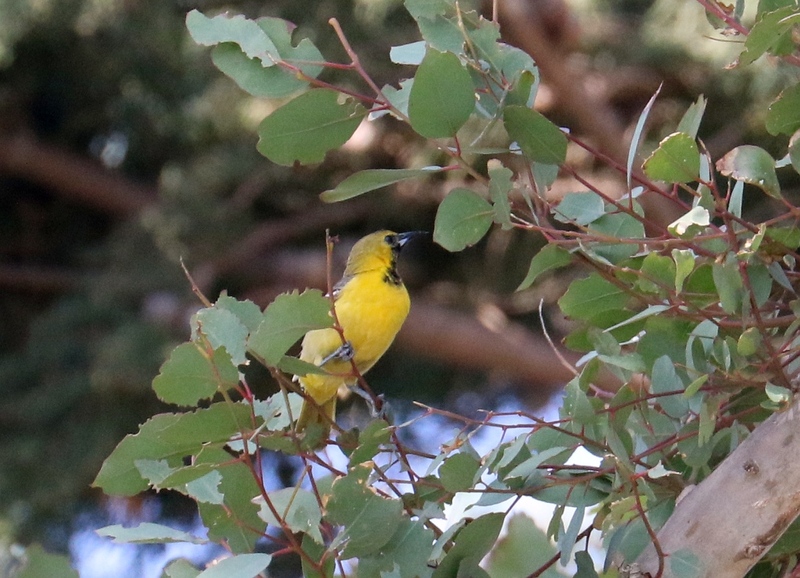 Also around, but not seen today, are deciduous-tree-nesting Bullock’s Orioles; orange & black males have black crowns and small black chin patches; the yellowish females have white bellies, unlike the female Hooded which are all-yellow underneath. Snowy Plovers, absent since January, remained absent, which is normal for May. Birds new for the season were: Pacific Loon, Red-tailed Hawk, Spotted Towhee, Red-winged Blackbird, Brewer’s Blackbird, Hooded Oriole. We finally got over to Adamson House but saw no additional species. 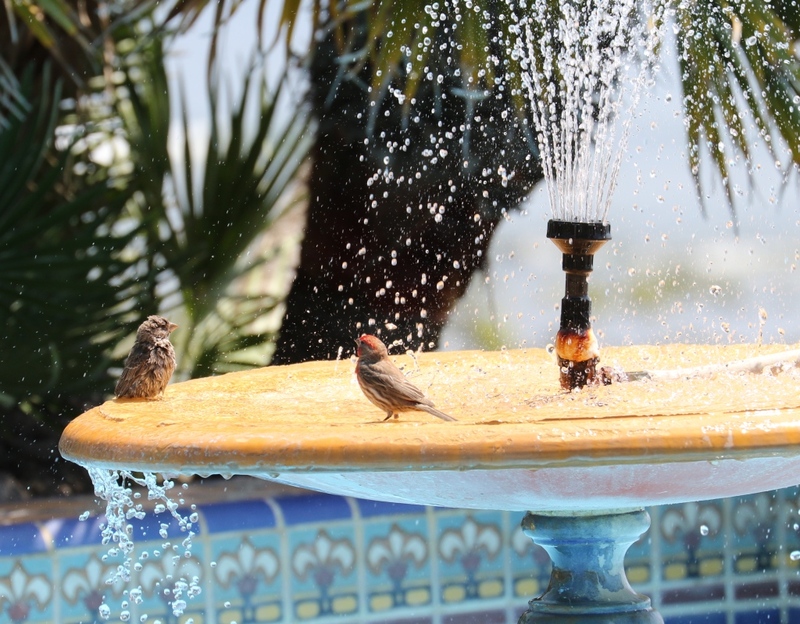 The House Finches were busily bathing, so we beat a hasty retreat. Our next three scheduled field trips: Mt. 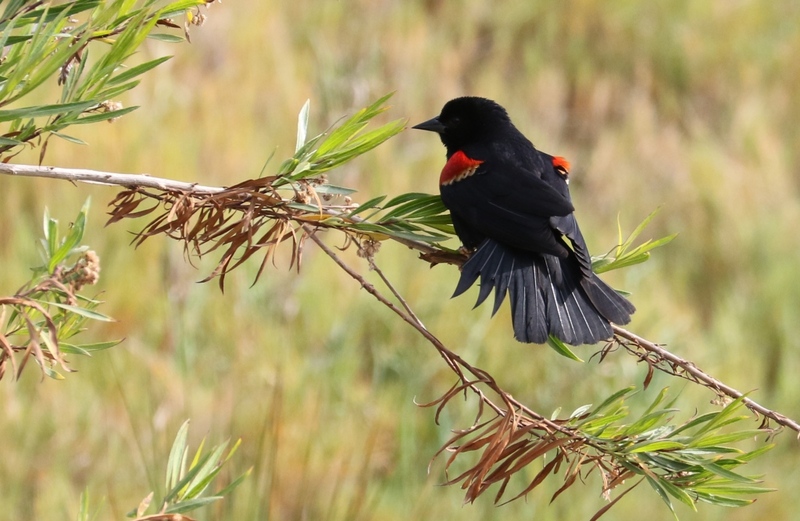 Piños Birds & Butterflies, 13-14 June, 8am; Malibu Lagoon & Picnic, 28 June, 8:30 & 10am; Malibu Lagoon, 26 July, 8:30 & 10am. Our next program: Evening meetings will resume on Tuesday, 6 October, 7:30 pm, at [changed again] Chris Reed Park, 1133 7th St., NE corner of 7th and Wilshire Blvd. in Santa Monica. NOTE: Our 10 a.m. Parent’s & Kids Birdwalk meets at the shaded viewing area. Watch for Willie the Weasel. He’ll be watching for you.